Dabur Almond Hair Oil for Hair, Face and Skin Benefits. 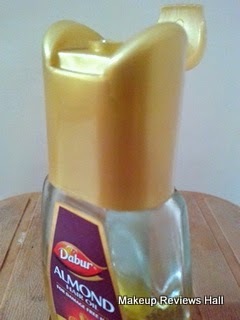 This post is about a hair oil from a very famous brand Dabur. Its Dabur Almond Hair Oil. I choose this oil because of its pleasant smell and non sticky texture unlike Castor oil - best oil for hair growth. Not only because of its light texture, but I also bought this Dabur Almond Hair oil because of its gentle pleasant smell, which can be used on skin and face ( not on oily acne prone skin). I have been using this Dabur hair oil not only on my hair, but on my skin as well and here is the review on it and my experience. Dabur Almond Hair Oil Details. "Silky, Strong and 100% Damage-Free Hair." Get ready to give your crowning glory oodles of style, appeal and nourishment with Dabur's latest natural wonder -- Dabur Almond Hair Oil, a one-of-its-kind product that offers superior nourishment for 100% damage-free hair. Dabur has combined the goodness of nature and scientific research to introduce Dabur Almond Hair Oil, a product that has twice the amount of Vitamin E as compared to well known almond hair oils and Almond Protein -- vital nutrients known for hair health. Dabur Almond Hair Oil is, in fact, the only product in the almond hair oil category with Almond Protein. Recommended - How Frequently Should You Oil Hair? Dabur Almond Hair Oil Price - Rs 55/- for 100 ml. 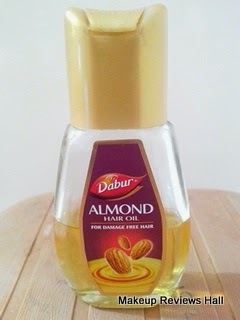 Dabur Almond Hair Oil Review and Uses for Skin. This Dabur Almond Hair Oil comes in a glass bittle with the flip at top, which does not get close tightly once opened. This is a big drawback of the packaging since I can't leave the bottle anywhere due to fear of leakage. I would have preferref a small whole instead of flip like the one in Bajaj Almond Hair Oil. Also the bottle is of glass which again requires extra care. So I am not very impressed with the packaging. The texture of this almond oil is light and non sticky. Its almost similar to Parachute Non Sticky Hair Oil, but the Parachute on is slightly more towards the lighter side. the fragrance is very similar to any almond oil and not at all irritating unless overused. Dabur Almond Hair Oil Application on Hair. I apply this hair oil on my hair one night before shampoo, so that my hair feels nourished after shampoo without the use of any conditioner. I don't apply it too much but just little paying a little more attention to the ends prone to splits and thus split ends. This way I don't even feel this oil to be heavy and it gives me tangle free manageable hair the next day after shampoo. I normally feel my hair tangled at the ends for which I use Matrix Opti Care Hair Serum, which works great in detangling hair. But application of this oil prior to shampoo makes me skip the Matrix Serum. 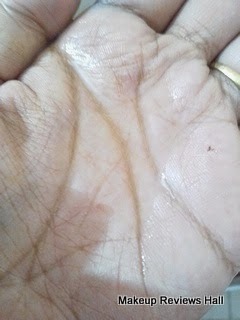 Dabur Almond Oil application on Skin. I have sensitive acne prone skin and thats why I don't use this oil on my face but I do use it on my skin- arms, legs, neck area. I normally this Dabur Oil on my damp skin after bath. this was its easy to apply and also penetrates in the skin giving smooth soft non greasy skin. This method works best in winters since this oil nourishes and soothes my dry skin beautifully without causing any acne. But I don't ever use this in summers on my skin since that definitely gives me breakouts. Read Get rid of Dandruff naturally at home. So this was my whole experience with Dabur Almond Hair Oil, which I shared with you. I quite like this oil on my hair and skin both but love it on my skin in winters. I have heard that using the almond oil on face gets you rid of dark circles, hyperpigmentation and acne scars but I haven't used this on my face since I have oily acne prone skin. People with dry skin can definitely give this a try on face. I am also trying my hands on Bajaj Almond Drops Hair Oil, which I will be reviewing soon. Good for daily or frequent use. Nourishes scalp and ends on using before shampoo. Gives shine to hair making them smooth and soft. Labels: Almond Hair Oil Uses, Dabur, Dabur Almond Hair Oil, OILS. I bought this product which contain 500 ml. But iam afraid to use. Because, its combination is 3/4 mineral oil and Almond is less than 1/4. Bajaj is best than dabur as it has more almond and less mineral oil. is dabur almond oil for hair is sweet almond oil or bitter almond oil? I bought dabur almond hair oil.but I.actually want a oil of almond for applying to the face and beard.so let me know this almond hair oil can i use on face ?